Noncreature spells cost 1 more to cast. 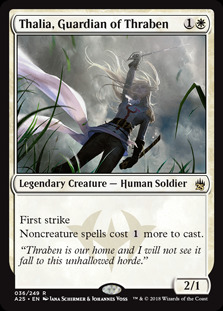 "Thraben is our home and I will not see it fall to this unhallowed horde." 3/16/2018 Thalia’s ability affects each spell that’s not a creature spell, including your own. 3/16/2018 To determine the total cost of a spell, start with the mana cost or alternative cost you’re paying, add any cost increases, then apply any cost reductions. The converted mana cost of the spell remains unchanged, no matter what the total cost to cast it was.